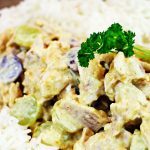 You are here: Home / Chicken / Chicken Fiesta – delicious & fabulously versatile! Chicken Fiesta – delicious & fabulously versatile! 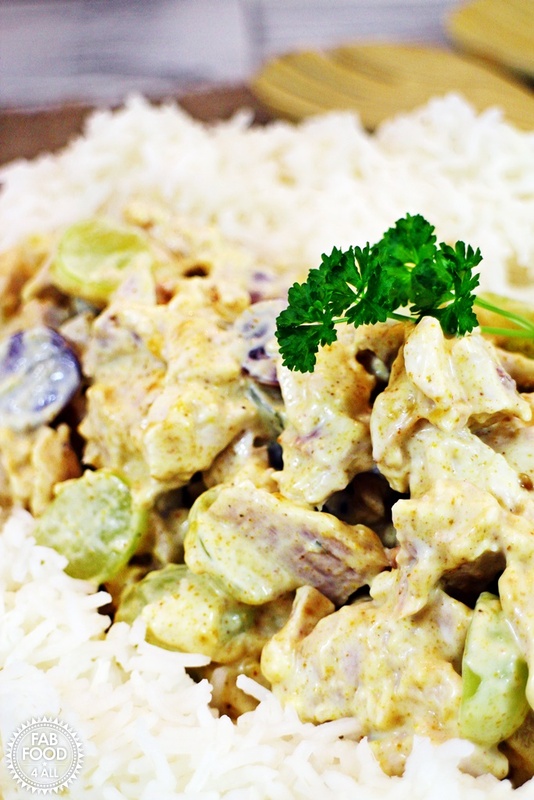 Today I’m sharing with you Chicken Fiesta, an old school recipe (similar to Coronation Chicken) that I have adapted over the years.I can’t believe I’ve not shared this before! I make Chicken Fiesta every time I have some leftover chicken and grapes in the fridge but rarely ever add the cream and when I haven’t had apricot jam in the house I’ve used mango chutney which goes equally well. I thought I’d share the original recipe with you along with my additions eg I usually use curry powder as I rarely have curry paste. 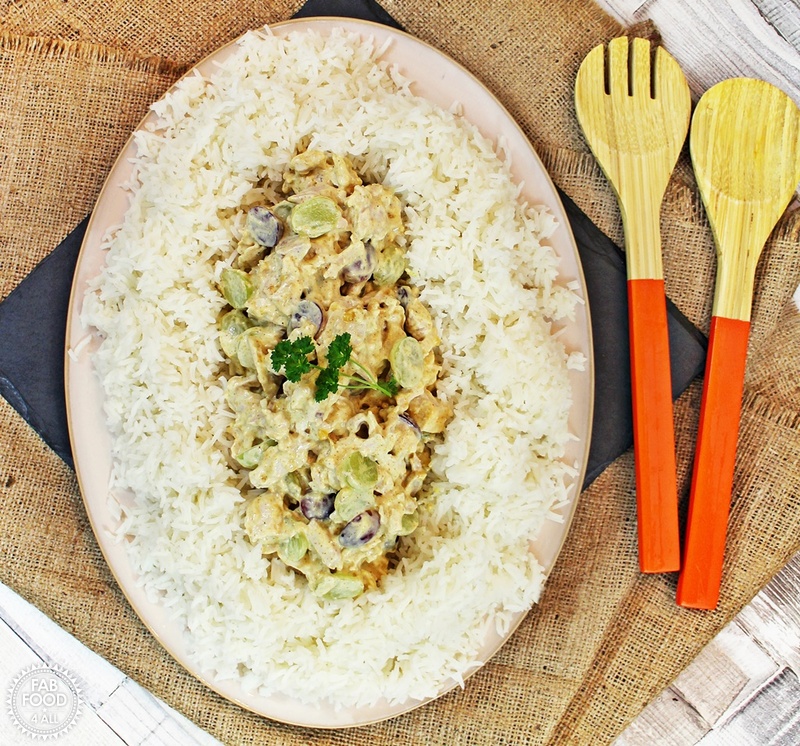 I usually use Chicken Fiesta as a sandwich filling as it’s not often have a lot of leftover chicken but recently I found myself with a large quantity so decided to serve it as a main meal together cold rice and I did add a splash of single cream as I happened to have some. If you make the original recipe below your dish will look a lot creamier due to the addition of whipped cream. I loved Chicken Fiesta so much when I was younger that I made it for my Home Economics A Level class leaver’s party as well as my 18th birthday. 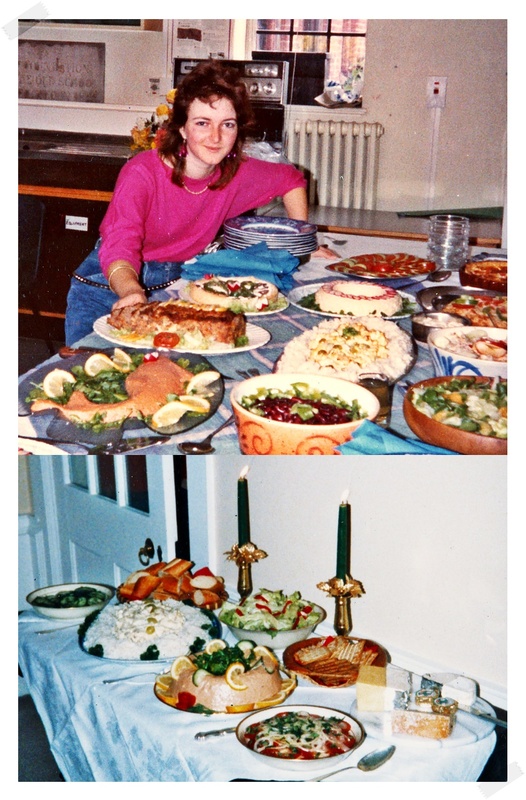 In fact I made all the food for my 18th birthday dinner party and I remember one of my friends thinking that my mum had done the catering! Can you spot the tinned salmon ring in the picture? I think that was the last time I used gelatine! So if you’re having a dinner party or need to take a dish along to a buffet then I’d say make the recipe as it is below but if you just want a quick and tasty sandwich filling just use the recipe as a rough guide and cut out the cream! Chicken Fiesta - delicious & fabulously versatile! 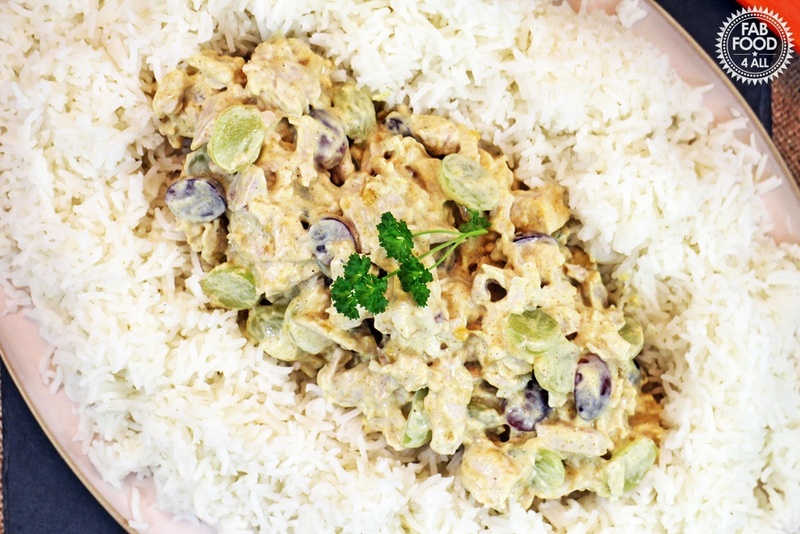 Chicken Fiesta is a bit like Coronation Chicken only more refreshing with the addition of grapes and apricot jam! Delicious as a main meal or used as a sandwich filling. In a large bowl mix together the mayonnaise, whipped cream, curry paste or curry powder and apricot jam or mango chutney. Fold in the chicken and grapes and season to taste. Serve with cold rice and salad or use as a sandwich filling if making a smaller quantity. We don’t usually have any left over chicken, but if we do I’ll definitely be trying this! I’d love to try this looks delicious will be having a go though I’m not big on cooking. Love the flavour in this recipes. Quite refreshing and light. Love this gluten free recipe and so retro 1970s too !